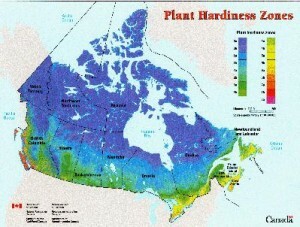 A zone map is guideline of the “average” lowest and highest temperatures for a particular zone. It’s important to note that it is just a guideline. Zonal maps apply more to perennials and woody plants than to vegetables or annuals. Remember, the lower the zone number, the colder the zone is and the shorter the growing season will be. The shorter the growing season, the more focus should be on selecting the specific vegetables and plants for success in your area.